Last Friday, while reading the Seattle Times article “Boeing CEO took home almost $29M last year” (referring to 2014) I was reminded of a recent conversation with some colleagues on the compensation of Boeing vs. Airbus Group CEOs. As both companies are public companies, this information is public and can be found in the annual report and proxy statement from each one. I will just copy the information below for comparison and future reference. I use 2013 references to compare both at the same exercise, as 2014 annual report from Airbus Group is not yet available. Airbus Group’s Tom Enders 2013 compensation. 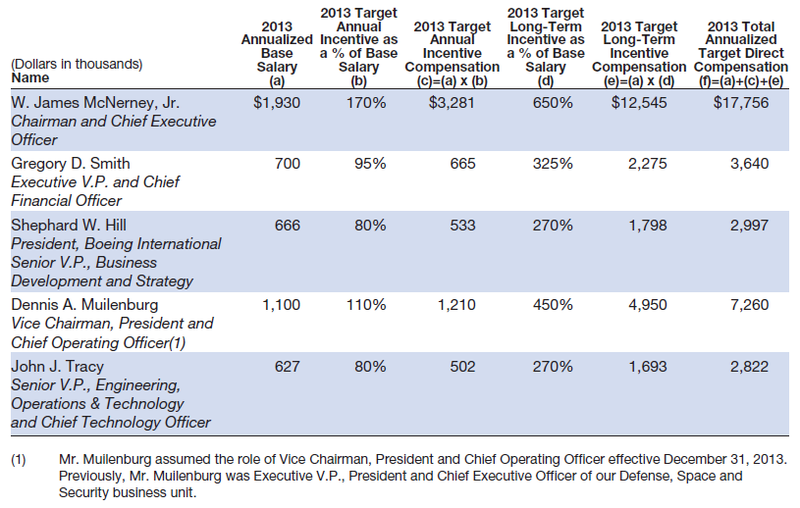 Boeing’s Jim McNerney 2013 compensation. Just as a complement, see in this article from The Washington Post “The pay gap between CEOs and workers is much worse than you realize“, based on a study by Harvard Business School, how the ratios of compensation between CEO and the average worker are in different countries, compared to what respondents to a poll said those ratios should ideally be.